Do You Need a CTO? There are several types of CTO leadership that could be right for your business. The rapid changes in technology are coming from all directions. Most of us think of technology since the advent of IT and networks, but technology can also mean a change in materials or business processes as well. Technology modifies the ground rules for products and services and forces the introduction of new business models and business processes. This is all part of digital transformation, and it's the job of the Chief Technology Officer (CTO). Do you need a CTO? Can you afford not to have a CTO? A Chief Technology Officer analyzes short and long-term requirements of an organization and uses capital to make investments designed to help reach the organization's objectives. The CTO role became more important with the advent of information technology (IT). It has increased in importance within technology businesses, where the CTO and CIO are at equal level. In non-technical organizations, the CTO typically reports directly to the CIO and is concerned with long-term issues. The CTO will be in charge of all company technology and technological resources by establishing the organization's technology vision, strategies, and plans for growth. Digitalization and digital transformation are found in all aspects of an organization's operations, which makes it difficult to draw a boundary around the CTO's areas of responsibility. It is hard to distinguish between the responsibilities of a CTO and a Chief Digital Officer (CDO). 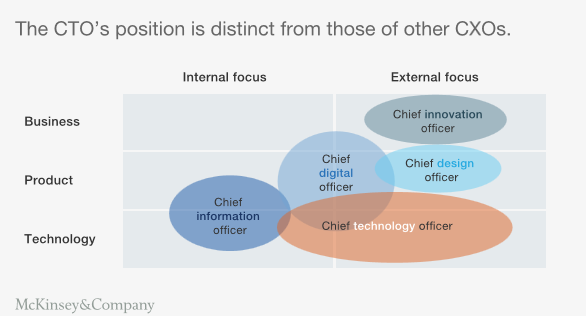 The difference is primarily that a CTO is equally concerned with product development and technology development, while the CDO is oriented toward business models and digital products and is more internally focused than a CTO (see my blog Into the Future with Chief Digital Officers). The graphic below illustrates the overlapping interest areas of multiple C-level executives. The graphics in this blog are from the McKinsey article "Why you need a CTO--and how to make her successful." A CTO enables an organization to compensate for threats, take advantage of opportunities, and deliver sustainable success. The CTO should have a number of qualities, including a full understanding of an organization's customers. The CTO must naturally have the curiosity to learn about new technologies and processes that are available or emerging. The CTO must have an imagination for the implications and possible uses of the candidate technologies. One factor that is often missed is the network the CTO has that includes universities, startups, and venture capitalists. Attending conferences is also part of the job. Finally, the CTO needs to have a mastery of systems engineering combined with a willingness to challenge what exists. Equally important as such personal qualities, however, is how the CTO role is configured for a given individual and a given organization by executing the right combination of responsibilities. Each type of CTO can be successful (see the four types in graphic below). It will be imperative to identify the approach which will work best. This will require some thought and the answer may not be obvious. If you do not have a CTO, then there may be pressure to move quickly. There may not be a honeymoon period when you can define just how the CTO is going to work within the organization. Mistakes may injure the CTO's reputation and lead to the loss of credibility. The graphic below provides guidelines for selecting the CTO operational style that best suits both the person in the job and the organization that person has to work within. Less technology-intensive segments, with lower R&D budget, spend a smaller percentage of revenue. These CTOs are likely to have a relatively low level of control over technology agendas and priorities. These are usually "influencers" or "enablers." Influencers are often technology scouts acting as thinkers, advocating for innovation through relationships with those who provide new technologies. Enablers are more management oriented. Enablers strive for efficiencies with an overlap in technologies and projects among the business units. "Challengers" and "owners" usually have more control over technology agendas and priorities. They thrive in technology-intensive companies that budget for large spending on R&D. 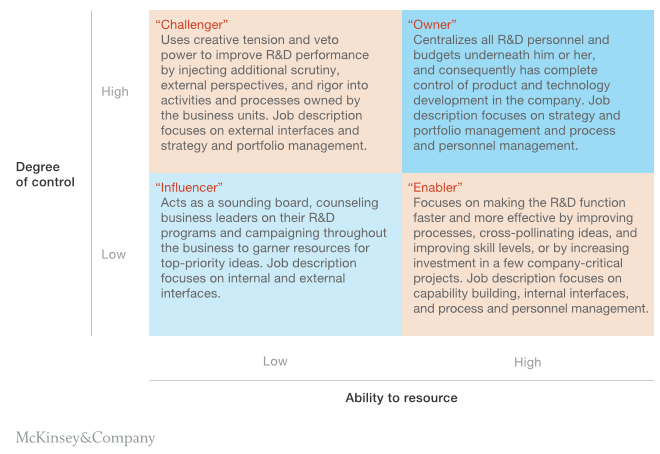 The challenger style works best in organizations with multiple business units that contain their own R&D operations. Organization owners are often found in single-product companies where one person has the requisite knowledge and power to makes things work. In a single-product business with limited disruptions is where technical excellence is represented at the C-level. You can promote someone within your organization who knows the organization. You can go outside your organization and recruit someone who has the experience that you need. If you have a limited budget or small organization, you may want to retain a consulting organization that can periodically help you fulfill the CTO functions and responsibilities. If you are looking for an extensive list of responsibilities for CTO refer to "Chief Technology Officer Job Description Sample Template."